Here is a list of best free batch file renamer software for Windows. These freeware make the task of renaming multiple files at once quite effortless and efficient. Using these bulk file renamer software, you can apply various renaming methods/actions like insert text or numbering (as suffix, prefix, etc. ), replace, remove, change case, add tags (MP3, ID3, MP4, EXIF, etc. ), add date and time, insert extension to new name, add separator, etc. They also let you filter particular file types to rename them. Many of these software are basic batch file renamer, which let you simply rename files using regular expressions (RegEx). The new name is displayed with original name to compare in real time. You can also rename folders using these software. Some of them let you save list of new file names or actions performed as TXT or CSV files. Also, these bulk file renamer freeware support all file types to rename, like video, audio, images, etc. Although, this list contains only best of the bulk file rename software. But, Bulk Rename Utility is one of my favorites. It is a feature rich software to rename multiple files with user-friendly interface. I like Batch File Renamer too; it is an easy and basic, but effective tool to rename several files simultaneously. You can also checkout lists of best free File Recovery and MP3 Tag Editor software for Windows. RegEx: You can rename files using regular expressions. Replace: You can replace a specific text or character from the name of files. Remove: It lets you specify number of characters to remove from start or end of files’ names. It lets you specify position of characters to remove them. You can also remove all characters, accents, and digits at once. It contains options like crop, trim, lead dots, etc. Add: You can add prefix and suffix to files’ names and add word space too. Auto Date: You can add creation, modified, taken, or current date as prefix or suffix to batch rename files. Others: It also lets you add numbering, append folder name, add extension, change text case, filter files with a mask, and more. It provides various other features like Retain Autonumber, Rename in Reverse Order, Prevent Duplicates, Overwrite/Delete Existing Files, Change File Timestamps, Change File Attributes, Character Translation, etc. All these features and a simple user interface make it one of the best bulk file renamers. Also, you can reset changes, change display settings, and do more. Advanced Renamer is another free batch file renamer software. It lets you import files to rename and specify Name collision rule (append image sub second, append pattern, append incrementing number, etc.) and Separator. It provides different tags to add to new names of files, such as ID3/MP3 tags, Image tags, Date/Time tags, Video tags, GPS Location tags, Checksum tags, etc. Other features of this bulk file renamer let you choose various methods to rename files. These methods include changing text case, removing a number of characters or a pattern, replacing specific text, adding a new string at a particular position, swapping values, renumbering, and more. Use Start Batch option to let it rename files instantly. You can also undo previous batch operation. Not just files, it also lets you batch rename folders with same tools. Advanced Renamer is highly recommended bulk file renamer. It also lets you view basic metadata of files. It has a simple user interface and is free for personal use only. Step 1: Simply browse files on your PC and add as many to the software. Step 2: Choose a naming pattern with Batch Name, Numbering Style, and Separator (space, hyphen, underscore, no separator, etc.). The preview of new files’ names is also shown here. Step 3: Here, you can choose whether you want to replace original files or make new copies. Then, select an output folder to save files. Step 4: At last, just hit the Start Renaming button. As simple as that. 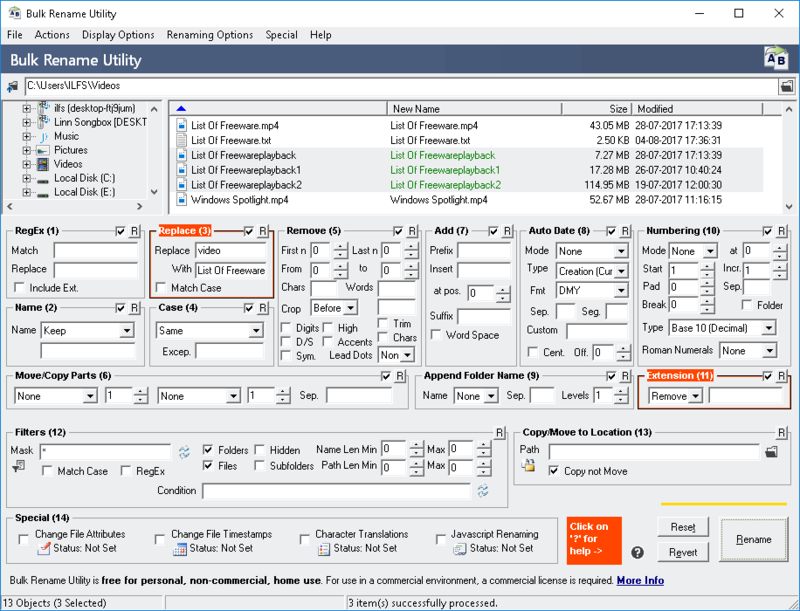 It is a lightweight and easy-to-use batch file renamer freeware. It is only meant for renaming multiple files at once, but with limited features. ReNamer is a free batch file renamer for non-commercial purpose. Add multiple files or folder of files and rename them by applying some rules. These rules are: Insert (suffix, prefix, at position, after/before text, etc. ), Delete (right to left, current name, character range, etc.) Remove, Replace, Rearrange, Extension, Strip, Case, Serialize, Randomize (with length, character to use, position, etc. ), Padding (number sequences, text padding, etc. ), Clean Up, Translit (forward or backward), Reformat Date (convert date format), Regular Expressions, Pascal Script, and User Input. You can add multiple rules one by one. It lets you apply filter settings, import/export file paths and new names as CSV or TXT, etc. You can modify preferences like general settings, rename settings, meta tags, preview settings, language, etc. It comes in portable version too. 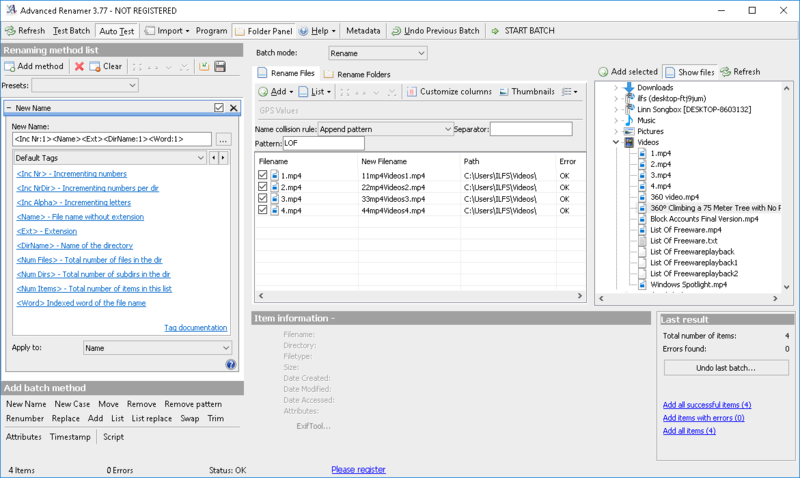 Ant Renamer is an open source batch file renamer software. It lets you perform various actions to rename multiple files at once. You can change extension and append it to the new name, replace one or multiple strings, insert string, move string, delete characters, use MP3 tag information for audio files, add date and time, use random names, change case, use EXIF info for images, use regular expressions, etc. You can see the new name with current name at the bottom of its interface. After performing an action, simply click on Go option to process changes. You can see activity log, save log as TXT or LOG file, remove dead files, and customize various options like display settings, processing preferences, interface language, etc. All in all, it a good tool to rename multiple files at once and save effort and time. Rename Master is another bulk file renamer freeware for Windows. It provides a side panel to browse files, folders, or both to rename. You can choose one or multiple renaming scripts to rename files in a batch. For example, you can remove all numbers/phrase/word from extensions or names of files, remove characters from one to another position, replace text/expression/numbers, add counter, and more. Also, you can use Split, Swap, Find and Edit, Change Case, etc. options to change names of files. After specifying parameters for each option, click on Rename button. You can generate batch file with name and ‘rename command’ to use. Also, it provides a Textfile tab to import data from text file to use as renaming scripts. It provides options to adjust interface, change color, font, etc., and other general preferences. It is a good bulk file renamer and comes in a portable version too. Siren is an open source bulk file renamer software. It lets you add expressions to rename files. These expressions can be regular ones (file name with path, extension, size in bytes, base name, date and time, etc. ), modifiers (case, substring, character set, transliteration, etc. ), tags (ID3, audio, video, EXIF, etc. ), file types (image, audio, video, and document), date format, environment, or IPTC. You get a pop-up window with all these categorized expressions by clicking on the option highlighted in above screenshot. Just double click on desired expressions and add them to rename files. You can also filter files with a specific extension to rename them. To start rename operation, go to Action > Rename. It also lets you view information of files, like DOS name, size, creation date, etc. It lets you view preview of files too. For example, you can see preview of an image file in a section below, open audio/video file directly in default media player, and so on. You can also copy content of selection to clipboard. Also, you can create copies of original files. It is a portable freeware and has a clean and intuitive user interface. Step 1: Add individual files or a whole directory. Step 2: Here, you can add any of the given renaming rules one by one. You can add text, metadata, and other renaming rules to change names of files in a bulk. For text, you can replace a pattern, add file extension, truncate a number of characters, add prefix or suffix, insert regular expression, change case, etc. As metadata, you can insert date and time, MP3/ID3 tag, WMA tag, Vorbis comment, Exif data, file size, and EML header. Also, you can add hash (MD5, SHA-1, etc.) and globally unique identifier (GUID). Step 3: In case you want to move renamed files to another folder, you can choose an output directory. You can view new names by clicking on Preview option. To complete the renaming process, hit the Start Rename button. It is a bilingual (English and German) bulk file renamer. You can also export file list to XML format. It is a portable and lightweight freeware. Flexible Renamer is a portable bulk file renamer software. Just add files and apply desired renaming patterns; that’s it. Selected files will be renamed in a matter of few seconds. Like other software, this one too lets you insert or remove number or string, translate letters’ case, replace strings, organize number value, and modify extension. For more options for each one of these methods, you can click on their drop-down menu. It provides an Advanced Rename option too to easily rename files. This option lets you select rename method (regular expression, wild card, or translation), search and replace text, add numbering, etc. It lets you filter files based on their file type. You can rename folders too. It also lets you modify tags and attributes of files and folders. Also, you can create numbered object under selected folder. Basic setting like interface font, rename options, etc. can be modified too. Ken Rename is another free batch file renamer for PC users. It provides different tabs of actions (Macro, Replace, Change Case, Remove, Insert, etc.) to perform for renaming multiple files. You can create macros and scripts by adding EXIF tag, MP3 tag, folder name, counter, ID3 v1/v2, etc. In addition to that, you can add text by position or specified text. Replace, remove, change case, and do more to change names of files instantly. You can also save the list of new file names as TXT, LST, M3U, etc. files. It lets you filter file list too. In case you want to rename files manually, it provides an option for that too (Edit > rename Manually). It provides addition tools like Error Log, Picture Viewer, Options for general preferences, Language, etc. It is another nice bulk file renamer software in this list, which you can try. Panda Batch File Renamer is another good batch file renamer. It lets you choose whether you want to rename pictures, music files, or any file types. Every file type is shown in the list with respective details. For example, for images, list is shown with dimensions and thumbnail. It provides similar renaming methods as above mentioned software. You can Insert text at start or end of name, Replace text, text block, section of text, regular expression, or accented characters, Remove text or numbers, Change Case, Reverse Text, and Trim text. It is a basic bulk file renamer software with easy to use interface. You can edit preferences like language, display options, etc. 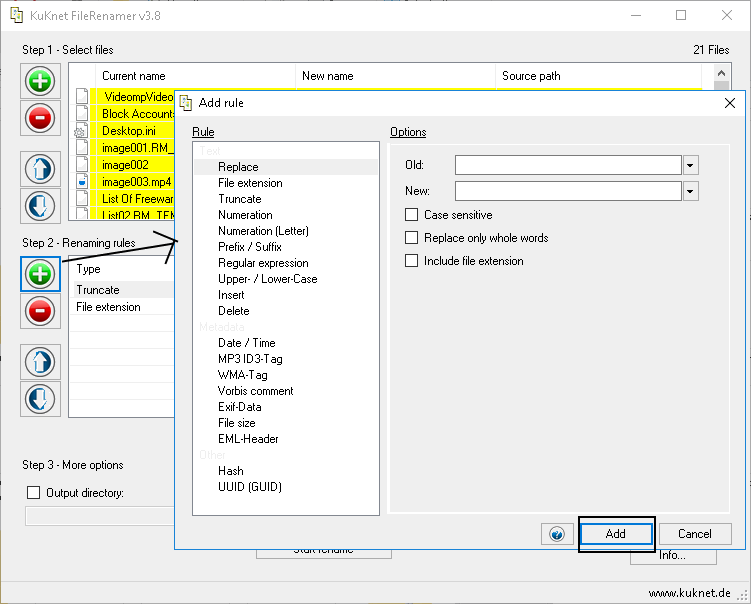 FMS File Renamer is a free bulk file renamer with different tabs to perform renaming actions, including Add, Delete, Replace, Case, and Move/Copy. Using these five tabs, you can easily rename bulk files in few seconds. Add: It lets you add characters as suffix, prefix, or at a particular position. You can add serial number and date (current, created, modified, or accessed time) too. Delete: You can remove all characters, non-characters, numbers, symbols, specific characters, or remove characters from first, last, or specific position. Replace: Just match a specific text and replace it with a new string. Case: To change the text case to lowercase, uppercase, or title case. Move/Copy: To move or copy a character or string to another position in the new name of files. You can include file extension in new name if you wish to. Hit the Apply Rename button after making changes. You can reset changes at any moment. It is a dedicated batch file renamer which is only meant for renaming bulk files at once. It has a basic and clean user interface. RegexRenamer is another basic batch file renamer. It lets you import files and rename them using regular expressions, by replacing text, phrase, characters, etc. You can also add numbering and change case to modify names of selected files. It lets you move files which match with current regular expression to another folder. You can also filter files. This software is good when you need to rename files with regular expressions and don’t need additional features to do so. It is an open source freeware. Multi File Renamer is a simple tool to batch rename files. Like any other mentioned software, even this one lets you perform actions including Replace, Capitalize, Insert, Delete, and Swap to rename selected files at once. You can add multiple actions and then click on Rename selected files option. Also, you can save these actions as Configurational files. It is a lightweight and basic batch file renamer with limited functionality. But, serves the purpose of renaming files quite well. IrfanView is a popular graphic viewer, which can also be used as a batch file renamer. It provides a ‘Batch Conversion/Rename’ option in File menu to do so. After clicking on this option, select Batch rename option; it will let you rename multiple files at once. You can browse files of ‘All files’ type and add to the software for batch renaming process. Now in Batch rename settings section, you can enter a desired name pattern to rename selected files. Click on Option button for more options to do the same. There, you will find options to set starting counter and increment value, replacing text, choosing options for output, adding a profile, and more. After adjusting all these parameters, you can hit Start Batch button. Before actual conversion, you can also test renaming files with Run test rename option. IrfanView can be used for basic file renaming; it doesn’t provide advanced tools to do so as other listed software. But, it is a convenient option for regular users of this software. Aoao Batch Rename is another dedicated bulk file renamer software. It lets you simply add files and rename them by entering new Name Pattern, Extension Pattern, and changing text case. It lets you choose increment order as alphabet or digit. You can see the preview of new file name with old names on its interface. To save changed file names, click on Run button. That’s it, selected files will be renamed quickly. 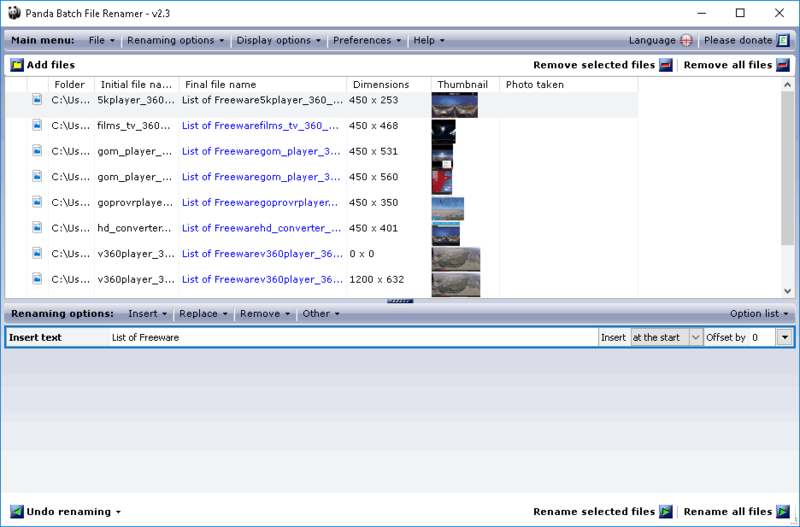 Fast File Renamer is another freeware to rename files in bulk. Simply add multiple files to the software and rename them by using Replace, Remove, and Insert operations. You can replace an original pattern with a new one, remove a pattern, and/or insert a specific pattern at a particular position to rename files. You can use Simulate button to see the preview of new file names. Later to save changes, click on Perform Rename. It is another basic batch file renamer. You can sort imported files, change interface settings, copy selected file names, etc. Rename Us is yet another batch file renamer software for Windows. It provides different tabs to Select files, Specify renaming actions, Choose execution parameters, view Preview, and Execute renaming commands. Renaming actions/rules include using enumeration, adding or removing prefix/suffix, inserting custom rules or expression, replacing substring, and changing case. You can edit a rule at any time. It lets you specify execution parameters like target location, error handling, execution log, etc. Finally, you can check the preview of new file names and execute the renaming commands. It is another nice and clean software to rename numerous files at once. It lets you sort and arrange (by date, type, size, etc.) imported files before renaming them.